THE sound of new trains that will carry members of the public for the first time have echoed through the century-old tunnels of a closed railway that ran beneath the streets of central London for 76 years. Photographs released exclusively to Heritage Railway show a train on test on November 16, preparing the way for public rides to be launched in the spring on the former Post Office Underground Railway, a 2ft gauge line built to carry mail from west to east London using driverless electric trains. 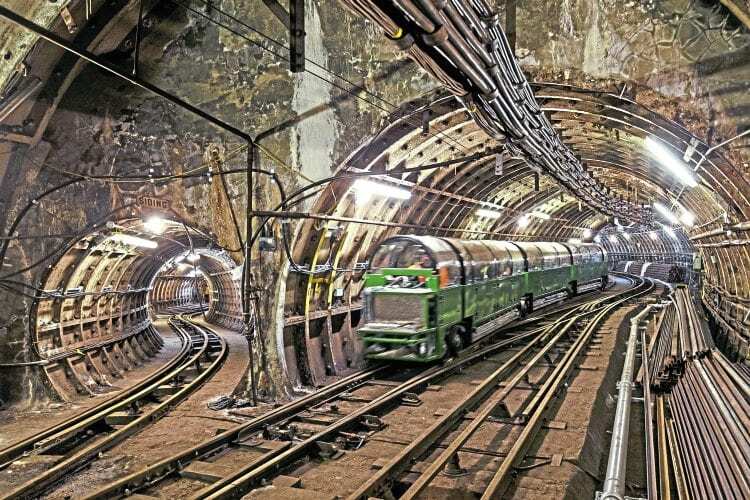 Built during the First World War but not opened until 1927, the 6½ mile line transported millions of letters and parcels each day 70ft underground, from Paddington to Liverpool Street and Whitechapel Road. It was closed in 2003 and mothballed, with regular maintenance carried out… but now visitors to London are just months from experiencing the unique sensation of travelling for the very first time on part of the route. The ride, named Mail Rail, will cover nearly a mile of the line, centred on Royal Mail’s Mount Pleasant site near King’s Cross station, halfway along the former route. It is being developed as part of a £26 million project that will also see the railway’s former maintenance and repair depot, where the rides will start and finish, converted into an exhibition centre, and also the construction nearby of a major postal museum.